My Hope Bag’s 4th Annual Golf Tournament will be held on Friday, May 3, 2019. Check-in 6:00 | Shotgun start 7:30 | Prizes, auction and lunch to follow. Entry fee is $100 per gofler, a 4 person scramble format. The price includes continental breakfast, golfer goody bag filled with quality items, 18 holes of golf & cart, lunch and lots of fun… all while supporting a great local cause! Please share this event with everyone you know as we would love to have a sell out again this year! It’s a great opportunity to host your customers, vendors or employee appreciation. If you have any questions, please feel free to email us at info@myhopebag.org. If you can’t golf but would like to donate an item for our auction or raffle please let us know. Do you know a breast cancer survivor who would enjoy a complimentary day of golf? 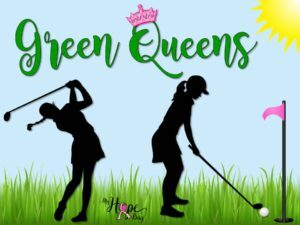 Consider nominating her to be an honorary GREEN QUEEN for the day… she’ll receive a special “Green Queen” shirt, tiara, golf, meals and other special goodies. Want to stay in the loop on this and other My Hope Bag events? Be sure to Sign up for our mailing list.